Before the establishment of the paid, professional Metropolitan Fire Department in 1865, New York City firefighting was an all-volunteer affair. This map, printed in 1834, was intended to mark locations of resources and split the city into districts, so that the many small volunteer fire companies could better handle emergencies. 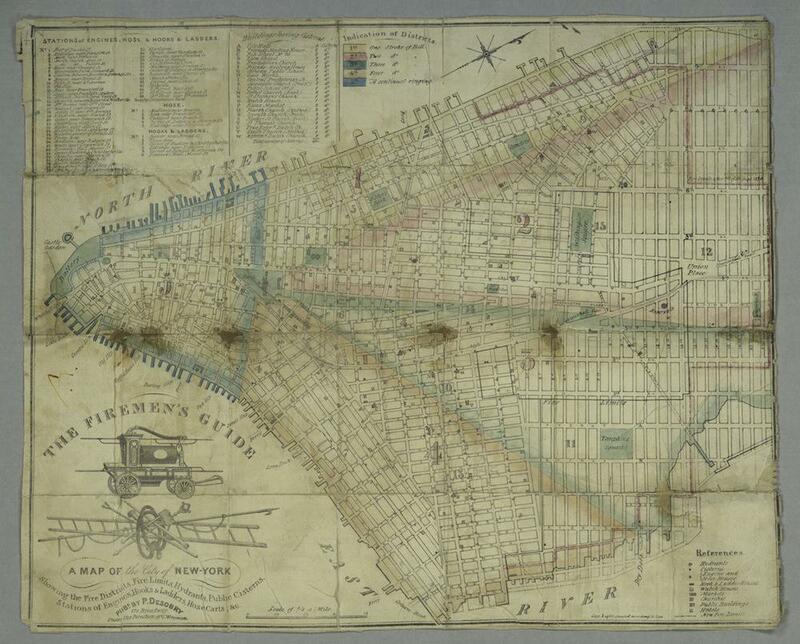 The map offers a good indication of the types of infrastructure New York firefighters had at their disposal in the antebellum period. As the New York City Firefighting Museum points out, the Croton Aqueduct didn’t start construction until 1837 (finally opening in 1842), so water availability was sparse at this time. The map shows the locations of hydrants and cisterns. Hydrants were distributed one per block on some streets, while other addresses were blocks from the nearest water source. The five districts are outlined in faded pastel colors. The key in the upper center of the map shows how firefighters might expect to know which district needed attention: a system of bell signaling, with a fire in the first district indicated by one tone of the bell, the second by two, and so on. Competition and rivalry between firefighting companies was common, and the system might have been partially intended to forestall the fistfights that often broke out on the scenes of fires. This map is one of the more than 20,000 recently made freely available for download via the New York Public Library’s digital collections. Click on the image below to reach a zoomable version, or visit the map’s page on the NYPL site. Published by Prosper Desobry, 1834.